Let's file this under "movies that I had on dvd but never watched because I am a stupid, stupid fool." Part of me is a little bummed that it took me so long to finally watch it, thus depriving myself of a really fun movie to rewatch over and over again -- probably costing myself at least a dozen viewings over the last few years. But part of me is really excited to have found Gambit this late in the game. It seems like very few new-to-me classic movies knock my socks off these days. I've already discovered most of my tried-and-true favorites by now and nothing new ever seems to impress me enough to share space on my All Time Favorites list with Sunday in New York and Doctor Zhivago. As you can probably tell, Gambit has made The List. I have NO idea how it eluded me for so long but I finally watched it today and I am so ridiculously smitten. I want to write it love letters and send it flowers. I want to take it for long walks on the beach and buy it dinner. I really, really like it, you guys. Our meet cute almost didn't happen -- I wanted to watch Cry Wolf (A spooky Barbara Stanwyck movie with Errol Flynn not being a pirate) but the DVD was missing. So I started flipping through my DVD binder and came across The Happy Thieves, an art heist movie starring Rex Harrison and Rita Hayworth. Which reminded me how much I really love movies about stealing art. Which led me to search for more movies of that sort on google. Which is how I found Gambit. I won't give much away (even though the poster encourages you to go ahead and spill the ending) but suffice to say, it's about an art heist. Michael Caine plays the criminal mastermind, fluctuating between effortlessly suave and slightly peevish. 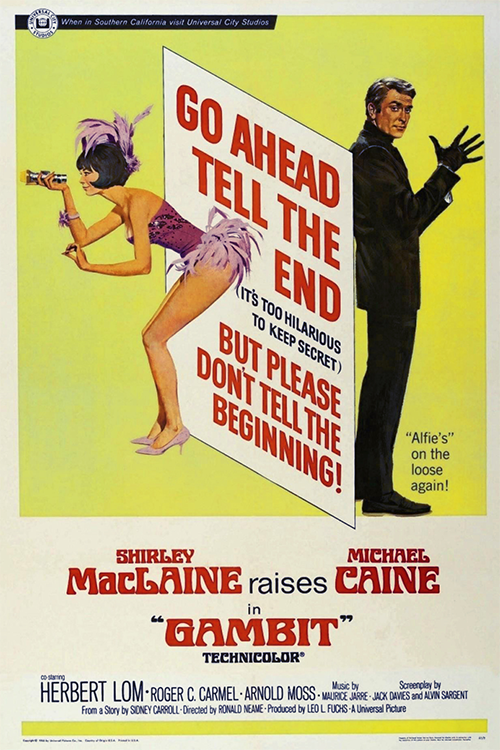 Shirley MacLaine is his partner in crime. If you're watching this for the first time and think she's being wasted as merely arm candy in the beginning, just stick around and you'll be pleasantly surprised. I promise. Gambit reminded me a lot of one of the veterans on my All Time Favorites list, How to Steal a Million. I don't throw that comparison around lightly, and it's not just because their plots are both centered around thefts of priceless works of art. They have a similar pace, their stars have great chemistry, the actual heists leave you biting your nails with suspense, and the twists are fun and unexpected. And much like How to Steal a Million, I can see myself watching Gambit dozens of times and enjoying it completely each and every time. I'm not sure if this is as funny out of context, but I found this one exchange from the movie so funny. Michael Caine's delivery is just so perfect, and I'm pretty sure it's going to be one of those lines that I quote at random moments for the rest of my life -- "Always interested in seeing something extraordinary." I too love How to Steal a Million, but have been on the fence about watching Gambit. Thanks to your review, I'm going to give it a shot. I love this movie too. The style, the leads, and of course the surprises. I've never understood why it's not better known. By the way, I love your blog! I used to be a reader of your other blog and was sad to see it go, but I'm glad you decided to continue with this one. If you ever have the time, I'd be honored if you checked out my own movie blog sometime: LoveLettersToOldHollywood.blogspot.com. GAMBIT! I saw like 3/4s of this on my Kindle using my sister's OnDemand...and then fell asleep, and while I slept IT GOT DELETED FROM ON DEMAND AND I NEED TO SEE THE REST BECAUSE 60S HEIST AND MICHAEL CAINE ARE MY LIFE. So, yeah, next time we get together, please let's make it happen! @KC I had recorded it from TCM years ago, but other than (presumably) reading the description in Now Playing and thinking it was worthy to record, I don’t remember ever even hearing of it before! It was apparently remade recently (and from what I’ve read it seems like the remake was pretty bad) so I’m surprised that didn’t create some renewed interested, either.